1887. The Viator, vertical engine. 1876 Robert Luke and Thomas W. Ashby retire from Ashby, Jeffery and Luke and a year later Edward Christopher Blackstone joined with George Edward Jeffery and it became Jeffery and Blackstone of Rutland Ironworks. 1882 Jeffery sold his interest in the business. 1887 Moved to new works. 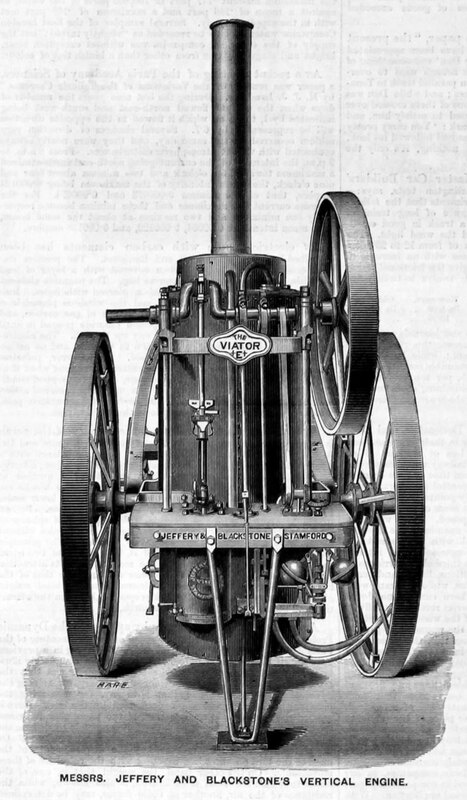 1887 Exhibited the 'Viator' engine at the Newcastle Show. This page was last edited on 14 June 2018, at 16:55.